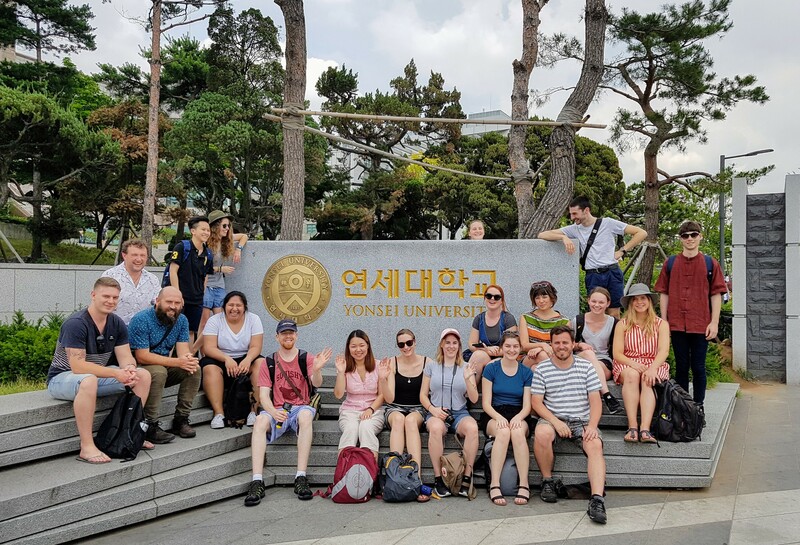 From 26th June – 9th July 2017 I co-facilitated an environment and sustainability-themed study tour to South Korea with undergraduate students from La Trobe University. This is the third iteration of the Environment and Sustainability Study Tour and first trip to South Korea, after two successful tours to China in 2015 and 2016. The Environment and Sustainability in South Korea Study Tour is a collaborative venture between the La Trobe University Department of Politics and Philosophy, La Trobe International, and local partner CERES Global, led by myself, Ben Walta from CERES Global, and La Trobe graduate Maxine Catchlove. Student participants were selected on a competitive basis to take part in this tour from disciplines across the university, which counted as a credit-bearing elective subject their undergraduate (POL3ESC), Honours (HUM4SIP) or Masters (HUM5SIP) degree programs respectively. South Korea study tour group at Yonsei University, Seoul. South Korea faces many significant problems resulting from transnational environmental degradation and the impacts of rapid economic development. At the same time, South Korea has become an incubator for many innovative political, economic and technological strategies to address these problems. Our tour engagements focussed on learning more about these innovations from representatives of academia, the NGO sector, business, social enterprise, and activist groups who are working in the environment and sustainability sphere at international, domestic and local levels. Articulate an understanding of the diversity of interests, values and perspectives that feed into environmental and sustainability-related in issues in South Korea, and their interaction with global environmental governance. Engage students with local-level environmental and developmental capacity-building projects in South Korea. Introduce students to the field research practices, including the composition of field notes, photo and video documentation, and reading landscapes for ecological, political, economic, social and ideological patterns. To increase the South Korea-literacy of student participants through in-country people-to-people interactions with host organisations which fosters their understanding of Korean politics, economy and culture. Establish ongoing, mutually beneficial collaborative relationships with host organisations. Our student participants will be moving into careers in the area of environment and sustainability. In addition to information exchange and friendship-building, through this study tour we would like to establish a network of professional contacts between Australia and South Korea that leads to long-term benefits and collaboration between our student participants and our new friends in South Korea. Reflect on our obligations to the biosphere, to society and to future generations as an integral componenet of political decision-making processes. Provide a basis for comparison with environment and sustainability practice in Australia, encouraging students to reflect on lessons learned in South Korea that could be applied back home in Australia. 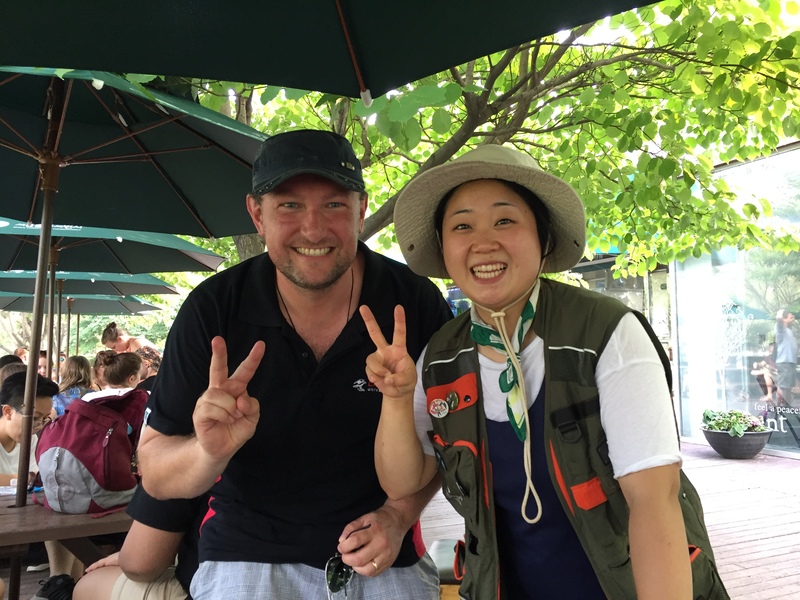 Ben Habib with Choi Jinkyoung from Seoul Forest Conservancy. The goals for the tour articulated above are based on ideas of reflective practice and immersion within a different ecological, political, economic and cultural reality. The conceptual design of the tour program and associated assessment activities was influenced by academic literature on transformative learning, including “Transformative Learning and Sustainability: Sketching the Conceptual Ground” by British academic Stephen Sterling. Prior to departure, students were asked to complete a research essay on an environment and sustainability-related issue in South Korea. This prior learning proved invaluable on tour, where individual students were able to take the lead in interpreting itinerary engagements that they had researched in their essays. As a component of the in-country experience, students were encouraged to observe and interact with the landscapes we visited, to experience for themselves the environmental challenges faced by South Korean society, and to decode what they saw and felt for clues as to the broader causes and potential solutions to the problems that they observed. The students reflected on their observations in regular group debriefing sessions, led by Maxine Catchlove. Intellectual Dimension: Identify key themes that stood out for them across the tour in South Korea. Existential Dimension: Articulate and explain how the tour in South Korea has prompted them to question their ways of living and place in the world. Empowerment Dimension: Articulate and explain how the tour fostered a sense of ecological responsibility and commitment to take action as an environment and sustainability professional. Emotional Dimension: Articulate and explain their emotional reactions to these places and experiences. Australian Chamber of Commerce in Korea. Korean Federation of Environment Movements. Kyungnam University—Institute for Far Eastern Studies. Yonsei University—Institute for Legal Studies. Tour group at Yonsei University. Lunching at the cafeteria in the Hansalim distribution warehouse. Hair nets to keep the organic tofu production line uncontaminated at Hansalim. Tour group at the Han River. Playing Jenga at Seoullo 7017. Tour group at Hansalim distribution warehouse. Tour group with Bernhard Seliger from the Hanns Seidel Foundation. Tour group in Seoul Plaza. Strolling through Dongdaemun Design Plaza. Tour group at the National Museum of Korea. Learning about international climate diplomacy at the Seoul Energy Dream Center. Descending the hill at Haneul Park. Tour group with Choony Kim at the Korean Federation of Environment Movements. Tour group at EAAF Flyway Partnership. Observing endangered migratory birds in Incheon. Maxine leads a debrief session.